After Coachella last month, I thought what a perfect time for my friends and I to visit Arizona while on the west coast. If any of you have ever seen the movie Waiting to Exhale, then you can remember how beautiful it was...the gorgeous homes, & bright desert! Plus, I had always wanted to visit the Grand Canyon amongst other sights to see. We drove straight from Palm Springs, California, which was about 4.5 hours away. Of course it didn't seem that long especially since we had a playlist made just for the road trip, many laughs, and made stops to take scenic pictures! When we arrived in Phoenix it was about 6pm and we were starving, so we got dressed and headed to Scottsdale for dinner. We went to a lovely outdoor seafood restaurant called "Crab & Mermaid" where we literally devoured their specialty crab dip because OMG it was so amazing to say the least! This restaurant is located on 4218 N. Scottsdale Rd, Scottsdale, Arizona---just in case you're ever in the area, you'll know where to go! This place also has a food truck...here's the link ---> Crab & Mermaid . After dinner we went to a place called Top Golf...which was suggested to me by one of my IG friends who lives in Arizona, considered this a super fun place to go at night! We golfed from a very high platform and it was an absolutely beautiful view and so much fun--by the way even though I'm not much of a golfer, I won the game!!! The next day was all about our adventure to the Grand Canyon, this drive was about 5 hours away from Phoenix, but so worth it! The views were so incredible, it literally looked fake... almost like a picture or post card! It was a little cooler up there, so if you ever visit be sure to pack warm outfits to wear once you make it to the top, so you won't freeze like I did lol! So peaceful, so serene, I loved every moment of being at the Grand Canyon! The next day, we woke up early to go grab brunch from Snooze, an AM Eatery where the food was sooo delightful! I had the any 3 pancakes- plain, blueberry, and chocolate chip along with an apple mimosa, I devoured everything ! 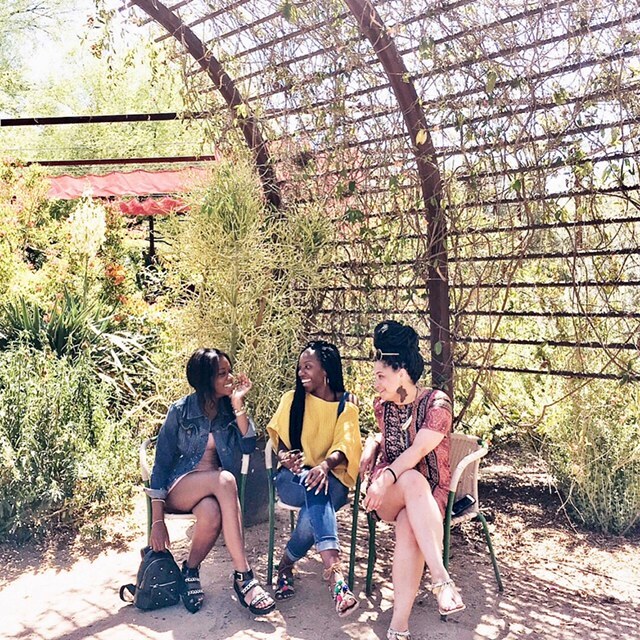 Right after brunch, we headed straight to the must see Desert Botanical Gardens, in the blazing 100 degree weather! Next, we decided to take advantage of Spa Week in Arizona (for those who may not know, spa week is similar to restaurant week where you can get really good deals for usually more expensive spa packages). We went to the Narande Spa at Phoenix, and boy was this so needed! The day was still not over at this point, so next up was horseback riding through the mountains at sunset! This specific day from start to finish was a non-stop adventure...we made sure of that! And to end that night we went back for more crab dip + food from Crabs & Mermaid--it was just that good... seriously! I hope you all enjoyed reading and if you ever visit Arizona, I hope you check out some of the places I've been, XO!